In 1881, reformer Henry Demarest Lloyd, author of Wealth Against Commonwealth, commented that John D. Rockefeller's Standard Oil Company had done everything with the Pennsylvania legislature except refine it. So complete was the Pennsylvania Railroad's control over the state house that Pennsylvania Railroad Presidents J. Edgar Thompson, Tom Scott, and Alexander Cassatt often held veto power over all important legislation. Indeed, the expression "Scott free" originated from legislation that passed through the state legislature without the Railroad's objection. How did this situation come to pass? First, the Republican Party, then the party of big business and high tariffs, ruled Pennsylvania for more than seventy years. During this era only one Democrat served as governor, Philadelphia's dynamic Robert Pattison, who was elected twice due to splits in the Republican Party among the Republican bosses and reformers. Fifteen of seventeen United State's senators were Republicans, and both Pittsburgh and Philadelphia were controlled by powerful and long-lived Republican city "machines." From 1860 to 1932, Pennsylvania cast its electoral votes for every Republican presidential candidate except one - Progressive Theodore Roosevelt in 1912. Pennsylvania's reliably Republican 32 to 36 electoral votes, second only to New York's 43 to 47, were critical in insuring that only two Democrats occupied the White House during the same period. Pennsylvania Supreme Court Justice George Woodward, circa 1863. During the Civil War, Pennsylvania's Democrats were notoriously pro-Southern. In its aftermath, Republicans received credit for the preservation of the Union. Pennsylvanian general George McClellan, who ran for President on the Democratic ticket against Lincoln in 1864, was solidly in the peace block, which further discredited his party. Pennsylvania Republicans, on the other hand, supplied several nationally distinguished leaders during the Civil War era. Radical Republican Congressmen Thaddeus Stevens led the movement to impeach Andrew Johnson and protect the rights of freedmen. Philadelphia's William "Pig Iron" Kelley was famous not only for his insistence on a high tariff on that product, but was a great supporter of African-American, women's and workers' rights. 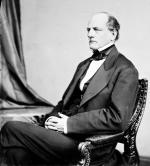 By the late 1860s, however, powerful new political bosses rather than the wartime leaders set the tone for the party. Pennsylvania's Republican kingmakers then turned to Civil War heroes to give them a respectable front. It speaks volumes for the disgust the machine inspired that Civil War governor Andrew Curtin became a Democrat, ex-general John White Geary was preparing to run for President of the United States on the Farmer-Labor ticket when he died in 1872, and Governor Henry Hoyt praised the people of Pennsylvania for reacquiring control of their own government when they elected his successor, Democrat Robert Pattison, in 1882. Other governors, such as James Beaver and Daniel Hastings, were honest but supported business interests, as did Pennsylvanian and U.S. Supreme Court Justice William Strong. 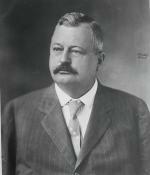 Beaver, like Democratic Presidential candidate Winfield Scott Hancock, only entered politics reluctantly. Like Generals Sherman and Sheridan, who refused to run for office at all, they identified the glorious aspects of their country with the army that had saved the Union, rather than the political system that besmirched it. 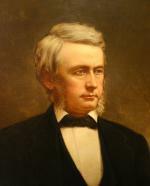 Pennsylvania Senator Simon Cameron, by John Dabour, 1871. The absence of a strong opposition party meant the Republican machine rarely had to keep its act honest in order to avoid defeat by the Democrats. This was not true, for instance, in New York, where reforming Democrats such as Governors Samuel Tilden and Grover Cleveland and liberal Republican journalist Horace Greeley achieved national prominence, and presidential nominations, for their fight against corruption in both parties. No one besmirched the system more than Simon Cameron, the man who forged the state Republican machine and presided as its first boss. A successful businessman before the Civil War, Cameron, after his election to the U.S. Senate in 1866, controlled the dispensation of state jobs and contracts. Cameron cemented his power, in part, by making loans from his Middletown Bank in Dauphin County to the party faithful, that he then called in or forgave depending upon their service to the Party. 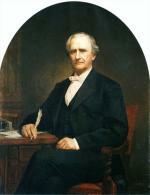 Cameron resigned his seat in 1877 after first arranging for Governor James Hartranft to appoint his son Donald Cameron to replace him. Donald led the Party for the next decade, then gave up the reins of power in the late 1880s to the most daring, resourceful, and, at times, merciless of the state bosses, Matthew Quay, who ruled over the state and was a leader in the United State's Senate until his death in 1904. Patronage was the foundation of the machine's power, at all levels of government. State and city employees were the "ward heelers," that is, men who supposedly wore out the heels of their shoes walking around their assigned neighborhood to make sure favors were done for the faithful: unruly boys were sprung from jail, men were given jobs on city construction projects, and faithful voters received cash, drinks, and other rewards for their vote - or votes. In the company coal and steel towns, immigrant voters who could not read were given pre-marked ballots by their bosses and marched to the polls. They voted Republican or lost their jobs. 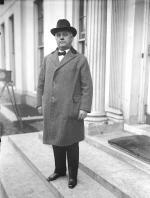 Philadelphia Congressman William S. Vare, 1923. 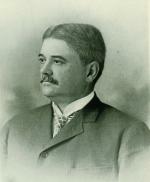 Pittsburgh Republican Boss Christopher Magee, circa 1895. In an age when private charities and mutual aid provided the basic network of social services necessary for survival, city governments provided jobs and "personal services" to their poor and working-class residents. This gave rise, most notoriously in Pittsburgh and Philadelphia, to corrupt Republican city "machines." In Philadelphia, Boss James McManes in the 1870s put together the famous "Gas House Gang." Awarding jobs to party workers and "personal services" to voters, Philadelphia's Republican machine would rule the city into the 1950s, its leaders confident that they were providing outstanding service to the city's residents. The city machines also worked with the saloons, gambling dens, and other commercial vice operations, which helped bring out the vote and paid protection money that helped fund the party's bribes and services. The city bosses also mastered the art of controlling the vote - by stuffing ballots, registering the same people in multiple precincts, and voting the deceased. In Philadelphia, even the Democratic Party was in on the deal: The Republicans paid the rent on its headquarters and guaranteed Democrats a certain percentage of offices to make it appear as if a genuine two-party system functioned. "The Making of a Senator," Puck, circa 1920. On the federal level, all government jobs were held by political appointment until the assassination of President Garfield in 1881 by an unhappy office seeker led to the gradual introduction of civil service. The post office and customs house were the two greatest sources of jobs. With Republican presidents in power from 1861 to 1913 (except for Grover Cleveland's two terms), Pennsylvania's Republican Senators could determine who got federal jobs. Union veterans, who as members of the Grand Army of the Republic formed a powerful political lobby, obtained many of these, along with federal and state pensions they received through special laws. The era of corruption came to a head with the construction of Pennsylvania's beautiful new state Capitol, completed in 1906. Costing what to us seems like a mere $13 million, it is arguably the most beautiful state house in the nation. But the state treasurer, the architect, and two other men went to jail for padding the bills and thereby doubling the cost of the edifice. 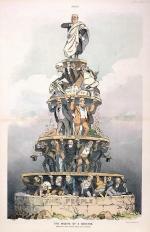 The Republican state machine created by Simon Cameron in the 1860s held together until the death of its last boss, Senator Boies Penrose, in 1921. In the 1920s, political power in Pennsylvania was split between the Mellon-Grundy faction centered in Pittsburgh and the Vare machine in Philadelphia. The Republican bosses continued their control of Pennsylvania until the mid-1930s, when the state voters, suffering under laissez-faire policies that kept out New Deal aid, ended the Republicans' seventy-year rule by bolting to the Democratic Party.